The Ohio & Erie Canal Towpath Trail or simply the 'towpath,' as it is more commonly known, is one of Ohio's most scenic bikeways. Much like the western section of the Emerald Necklace Trail, the towpath follows a river along the Cuyahoga Valley floor in northeast Ohio. Whereas portions of the Emerald Necklace parallel a parkway road and bridal trail, the towpath travels alongside the Cuyahoga Valley Scenic Railroad and the old Ohio-to-Erie Canal route. Both trails share the beauty of the Cuyahoga Valley National Park and are in close proximity to each other. In fact, the Akron Bike & Hike Trail is also nearby bringing the total to 3 major bike trails in the area! Along with the Little Miami Scenic Trail, the towpath is probably one of the two most visited trails in Ohio. It rivals the Little Miami in total length as well. The entire section of canal corridor that's being developed for trail use will be approximately 100 miles long and extend from Dover (just north of New Philadelphia) to Lake Erie in Cleveland, when completed. The towpath and Little Miami Trail are also part of the Ohio-to-Erie Trail. It's only fitting that these two fine bikeways that lie at opposite ends of the state are part of what will be the first cross-state trail in Ohio, when completed. Completed sections are constantly expanding and being developed. Construction of the Ohio-to-Erie Trail continues to spur development to the northern portion of the towpath, but there is also trail building to the south as well. Riding along much of the towpath means riding on a finely crushed stone surface. For you asphalt junkies this may be a concern, but fear not. The surface is firmly packed and can easily be navigated on a road bike. Newer sections may have a few spots that are not yet packed down, but for the most part these areas are few and far between. If you don't like cleaning your bike, however, you should know that the towpath can be fairly dusty, particularly during extended dry periods in summer. The dust isn't a problem while riding, but a good bike cleaning will be needed afterward. If this sounds like a hassle, try riding the trail the day after some rain. Dust was not a problem during our ride. Towpath riding can also mean dealing with closed trail sections. Since the trail often is no more than a foot or so above the waterline, the towpath is more easily subject to flooding and washout than other trails. Check with trail section overseers, such as the Cuyahoga Valley National Park web site, when you suspect the area where you wish to ride may have suffered from heavy or prolonged rains. The towpath is very well signed. Street crossings and connecting paths (even overhead railroad bridges and pipe lines) are marked with signs. This is invaluable to trail users riding through unfamiliar areas. The Cuyahoga Valley is fast becoming one of my favorite areas in Ohio to trail ride. The Emerald Necklace, Akron Bike & Hike Trail and the Towpath will cover roughly 190 total miles when the 3 trails are completed. Much of this mileage lies directly in the heart of the Cuyahoga Valley which provides a wonderful refuge from nearby cities and suburbs. The biking trails and the natural beauty of the valley form a winning combination. You'd be hard pressed to find a better match anywhere in the state of Ohio. We selected Peninsula as our starting point. It's between Cleveland and Akron and has parking right along the trail with restroom facilities. There's also a train depot for the scenic railway and a restaurant and bike shop -- all the ingredients for a great trail ride! On the ride north I noticed the scenery was quite different from my other visits to the trail. It was now mid-November and the trees and brush were bare. With all the leaves down I could clearly see any/all parts of the old Erie Canal. It was like a canal history tour by bike! Remaining sections of the canal were laid bare, whereas some sections are obscured by trees and brush in summer. Many portions of the canal still hold water. Others have only puddles from rain or runoff or are completely dry like a huge, barren drainage ditch. Where water still slowly flows the canal must look as it did many years ago with towpath once again in working order. The only things missing were the mules and canal boats. Water fowl seemed to be anywhere there was water -- not only in the canal, but the nearby river as well. A large number of Canadian Geese even blocked a section of trail near one of the locks. (Apparently they don't believe trails should be multi-use.) I don't know if they winter here or were making a temporary stop, but it was good to see so much wildlife. There are a couple of restored buildings along this section that now serve as small exhibits and information stations. One has a working lock (lock 38 shown in picture above), the other houses a canal exhibit (at Boston Mills Road). I was pleasantly surprised with the restrooms facilities along the trail. They were clean and well-maintained and most importantly, still open this late in the year. When I puzzled over why they weren't closed, my riding partner reminded me that we were in the Cuyahoga Valley National Park. He pointed out that the facilities here may be open all year round. Further north we passed through a construction zone on a highway perched perhaps 200 feet above our heads. I was impressed that the trail was kept open here. As the trail continues north it transforms itself at Rockside Road in Independence where the crushed stone trail turns to smooth asphalt. The large trailhead structure here, Thornburg Station, is a commercial complex with food and parking. From this point northward CleveMetro Parks signboards appear as you draw closer to Lake Erie. If you've ridden the towpath before, you may know that the mile marker posts count down to zero at the lake. This provides a neat way to gauge how far you are from the north coast from any point on the towpath. In Independence you'll pass under the super structure of I-480 that towers overhead. To this point street crossings had been fairly quiet, rural and infrequent. Now the crossings become busier and more congested as you encounter some development right in the valley. But that inconvience was recently addressed as Lynda Warner reports: "As of last fall (2006), two very unique bridges were opened, which remove the stress of having to cross two major intersections. The paved 5.7 mile section of the trail from Rockside Road north to Harvard Road is actually in the Ohio & Erie Canal Reservation of The Cleveland Metroparks, which funded the bridges." Just after encountering the busier sights and sounds, they soon disappear as you head into an area of railroad bridges and pipelines. Wooden structures are built under the railroad tracks that hover over the trail to protect cyclists from falling debris. Though this area initially appears industrial, it is in fact quiet with grass, picnic tables and canal alongside. There's a visitors center just off the trail here and a short .6 mile trail loop that connects to the towpath. The trail continues on to the Harvard Avenue Trailhead. There is another short section of completed towpath that lies to the west at Steelyard Commons. View it on this map. From here we were only about 5.5 miles from Lake Erie. Though we were now in Cleveland, it certainly didn't feel that way. 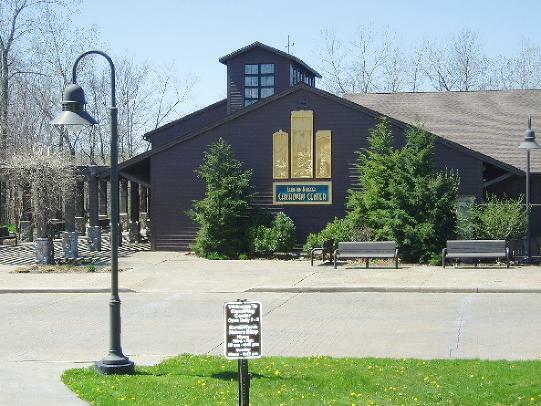 The Cuyahoga Valley had created its own peaceful environment along the towpath and carried it close to the lake where people were catching fish in the canal waters. I felt like we had sneaked past much of the big city on our way north. It'll be interesting to see how the remaining miles play out as an industrial area still stands between the towpath and its final destination. The route south from Peninsula along the towpath was designed a bit differently. It features many gentle curves to give more interest and character to the trail. To my knowledge, this is the first Ohio trail that was deliberately planned this way. Does the design work? Yes, definitely. The layout is certainly more interesting than a predominately flat, straight trail. The only drawback is that sight lines can be limited and passing can be tricky on days with heavy trail traffic. Considering this is one of Ohio's most visited trails, it's safe to say that cruising this section on weekends involves a lot of passing! Newer sections of the towpath are about 10' wide. Some older sections are a bit narrower, maybe only 7-8' wide in places. You'll also find some short sections of asphalt surface along the trail. These are usually found next to bridges and some paved parking facilities. There are several unique trail sections that are constructed to form a boardwalk. These wooden segments are approximately 14' wide and feature wide, sweeping turns. One section takes you over a wetland while another overlooks a golf course. When riding south you pickup speed on a slight downhill and can hear the deck boards "sing" when a rider comes zooming past. Be careful on rainy, wet or frosty days. The surface is bound to be slippery. More boardwalk sections can be found further north. Heading south the trail takes on a gently rolling character. The towpath appears to be relatively flat here, but that is not the case. In fact, you are gradually climbing. I wasn't aware of this until we headed back from the Mustill Store at North Street in Akron. You pick up speed as the downhill sections become more obvious on your way back. If you ride fast enough here, you'll be able to create a type of slaloming effect with the "S" curves. The towpath passes underneath the Scenic Railroad tracks and parallels the trunk sewer. The sewer line is more interesting than its name suggests. It's a large, closed concrete pipe-like structure that is partially buried in the ground. The portion that protrudes above ground is somewhat obscured by brush and moss in summer and takes on a rather curious look in the surrounding landscape. There is no odor from the sewer line, but the trail does briefly pass a pungent area that appears to be a compost facility. I had no idea that decaying brush, leaves and grass could produce such strong odors. Oh well, it's certainly no worse than the smell of farm manure and you'll be past it in short order. When the towpath enters North Akron the surface turns to asphalt with a stone chip top coat. This section is no more than a mile long and the towpath returns to crushed stone once you leave this developed area in the city. There are several places to eat here, so take advantage of nearby restaurants if you're hungry. At North Street there's an historic building called the Mustill Store. Formerly a general store during the glory days of the canal, it now serves as a museum displaying goods and trade from that era. There's also a trail parking lot and facilities at this trailhead. Previously the trail had ended here, but construction has extended it further south to near Martin Luther King Drive. As mentioned in the Emerald Necklace review, cycling in the Cuyahoga Valley is hard to beat. Cycling options run the gamut from parkway roads to paved trails and towpath. The terrain is also made to order. You can hill-climb to your heart's content or stay on one of the valley floor trails to ride the flats. The towpath out of Clinton has been extended north beyond Center Road to Vanderhoof Road. In fact, construction has already begun work to extend the trail roughtly 2 miles further to connect with the Barberton Trailhead at Snyder Avenue. Barberton has a 4.3 mile completed section of towpath that runs alongside the canal. It stretches from Snyder Avenue, near Second Street, to Manchester Road near Carnegie. Starting at the Snyder Avenue Trailhead (parking & latrine available here), the trail follows an old, potholed dead end road for 100 yards or so before it becomes smooth towpath. The canal is alive and full of water here, as it once was when canal boats ruled these waters. You'll see fishermen trying their luck as you ride through an industrial zone that gives way to residential housing. Here back yards abut the canal and decks occasionally protrude out over the water, along with a dock here and there. But the pleasure of riding next to a "working" canal soon comes to an end at Manchester Road where a newer parking lot has been constructed. The towpath continues on at this point, on the other side of Manchester Road, but may not yet be open due to construction along that stretch. This towpath section is likely prone to washouts since the trail dips close to water level in a number of spots. I'm sure this is an issue in many other areas along the towpath as well. A statue has been erected at Manchester Road. It's a bronze of an indian carrying his canoe. It's a monument to the original Portage Indian Trail which followed a section of the Cuyahoga Valley. This monument can be found at each terminus of the trail, the Cuyahoga and Tuscarawas. 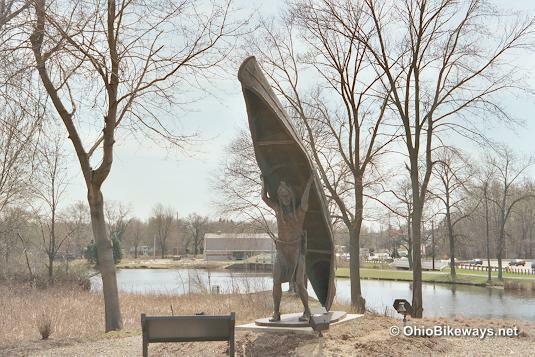 The Cuyahoga statue stands along the towpath in Akron. A one-mile long section of towpath begins at Summit Park in Akron. The park entrance is off of Lakeshore Boulevard, just south of Rts. I-77 / 76. The trail begins behind the recreation center and ball fields, alongside Summit Lake. Here the towpath is a 12' wide concrete path that extends right through the city over to Thornton Street, about .6 mile away. At Thornton the trail turns to old asphalt with a gravel topcoat. In fact, I'm not sure it's trail at all. It may simply be an old, wide sidewalk that continues along where the canal waters appear once again. 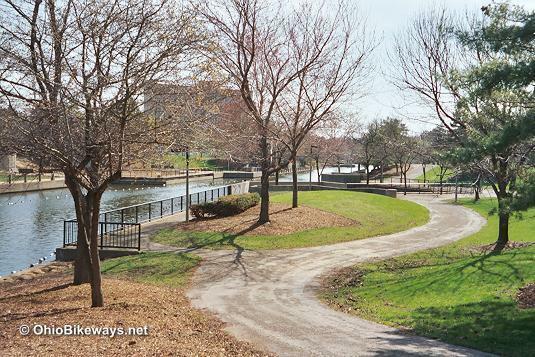 This area has been landscaped at one time and features a wide, rolling walkway with green lawns that come sloping down from adjoining apartment complexes to meet the canal. There is a gazebo, a couple of pedestrian bridges, and a rope with blue and white buoys floating along both edges of the canal waters. This area was quite an interesting, unusual sight. Excellent use was made of the canal here. This rolling section continues about .4 mile and ends at Bartges Street where commercial sites block the trail from continuing on its current path along the canal. Finding a route for the trail through urban areas presents a real challenge. There was a fair amount of broken glass on this bikeway the day I visited (mostly near the rec center). This is often the case where bikeways move through more populated, congested areas. Be sure to carry a pump, patch kit and spare tube! There is another short section of trail further to the north in Akron at Canal Place that runs parallel to Broadway. Here's a report by Joe Chase: "This [section] extends from the Akron Civic Theater south through a public festival park, around the west side of the Canal Park Stadium and down to the parking area behind Canal Place (the old BFG factory). "Part of this section of the canal was once covered by a parking deck; the city has done a great job removing decrepit buildings and landscaping the canal in this area. From this path north to the Staircase Locks [near Martin Luther King Drive], the canal has been buried forever beneath office buildings and the Akron Innerbelt, but the water still flows. Did you know the lobby of the Civic Theater is actually a bridge across the canal? "On Google Map's 'Satellite' setting, the red-surfaced trail is quite visible looping around the outfield of the stadium, and you can trace the southern section (concrete or asphalt) down to Canal Place." Canal Fulton is another great towpath starting point. There's plenty of trail parking, places to eat and a canal boat ride! The Towpath ride north from Canal Fulton to just north of Clinton is approximately 7 miles. The trail surface is the classic towpath crushed stone that is firmly packed. The ride is scenic, as is usually the case along the Ohio & Erie Canal. It's made more interesting since this section is not perfectly flat or straight. It gently bobs, weaves and rolls its way through the lowlands adjacent to the canal. As you enter Clinton a duck pond borders one side of the trail, while the canal lies opposite. As in Canal Fulton, your exposure to the small town is brief and before you know it you're once again riding in a rural setting. Beyond Clinton you enter an area that's designated as Clinton Towpath Metro Park. Here the trail briefly turns into boardwalk. You'll get a look at canal locks and an overlook viewing platform, as well as a short section of rail line that appears just west of the trail. The bikeway crosses Center Road where parking and restroom facilities are available. Here the trail is made up of asphalt covered with stone chips. This section was extended north to Vanderhoof Road where a new trailhead has been constructed. Construction is now underway to bridge the remaining 2-mile gap to the Barberton Trailhead at Snyder Road. One of the fun things about exploring new trails is that you sometimes stumble onto something you didn't even know was there... like another trail! I noticed the Olde Muskingham Trail during my visit. It runs parallel to the Towpath Trail from Canal Fulton to Massillon on the opposite side of the river. It has a gravel surface and spans roughly 6 miles between the 2 cities. A connector to the Sippo Valley Trail is also nearby and travels from Massillon to Dalton, Ohio. We started our ride south from Canal Fulton at the canal boat ride at Cherry Street (Rt. 93). We passed the boat house and started out on a wide section of towpath where the trail is sometimes shared with the canal boat horses. Be sure to yield to the horses. The trail ride south of Canal Fulton is also scenic and features the classic crushed stone trail surface. 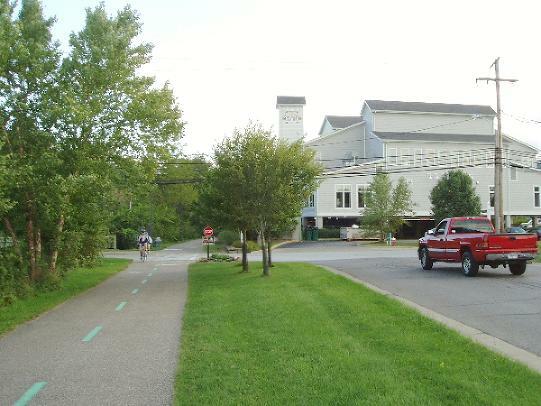 The trail takes a jog at Towpath Street as you enter Massillon and continues over to the Lake Avenue Trailhead. You'll find most everything here as John Snively points out, "...the Lake Ave Trailhead in Massillon has a full service bike shop (including rental bikes), a restaurant, and a Running Supply store. There are also heated restrooms and a large parking area. The Stark County Bike Club does both trail and road rides from the that location every Mon and Wed at 9:30. Our ride schedule is available at bikescbc.com." The trail continues over to Lincoln Way West (Rt. 172), and deposits you on the sidewalk just a few yards away from the Third Street NW intersection by way of the connecting ramp pictured above. Essentially the bikeway leaves the Tuscarawas River Dike for a few blocks via a detour, then picks up on the dike again at Walnut Street. You can continue south on the towpath or pickup the Sippo Trail by way of the directions that follow. To pickup the Sippo Valley Trail that lies a mere two blocks away, stay on the sidewalk and peddle west (turn right) and cross over the river on Lincoln Way. You'll see signs directing you past Bottoms Park as the Sippo leads you west to Dalton, Ohio. If you want to continue south on the towpath, you have a couple of options. You can take a short road route: Option 1 - Right (west) on Lincoln Way, then left (south) on 6th Street to left (east) on Walnut. The trailhead will be on your right at Great Lakes Boulevard (Rt. 21). Option 2 - you can take the Sippo Connector part way by following the above directions for Bottoms Park. Only instead of taking the Sippo Trail west toward Dalton, turn around and follow the connector back under the bridges and south along the river. This connector does not hook directly into the towpath. There should be signs to direct you over the final short street section to reach the trail. If not, use the Option 1 route as a general guide as both routes head in the same general direction. The street detour is about a mile long. 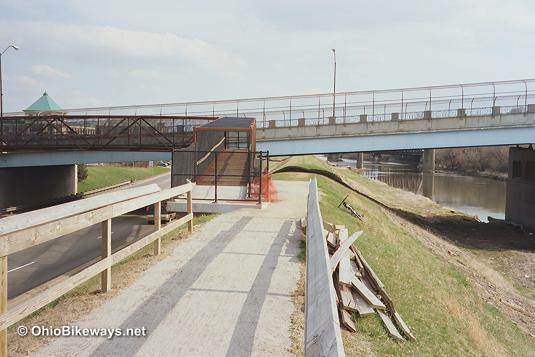 The towpath resumes atop the river dike at Walnut and Great Lakes Boulevard (Rt. 21). Once again overlooking the river, it leads you on to your next destination, Navarre, which is about 6 1/2 miles away. The ride from Canal Fulton to Massillon is about 7 3/4 miles. A section of the towpath had been closed just south of Massillon near a water treatment plant. Reports are that it's now open. We'll leave part of the detour directions (below) in for now, should you want to take advantage of nearby restaurants. Here's the detour: Go around the concrete barriers. Just after the barriers you'll see a path that takes you up an incline to your left and away from the towpath. Follow the path up the hill. At the top you'll find yourself on a grassy shoulder alongside an exit ramp. Ride with the traffic and follow the exit ramp up to the stop light. Turn right at the light. This road accesses local shopping and restaurants. Take advantage and get something to eat if you're hungry or refill your water bottles. During the trail closure you had to rejoin the towpath by way of a local gravel pit. Now that it's open, you can just retrace your steps. Further south the towpath extends through Navarre, dispensing with the road route through town. Should you venture away from the trail, use the blue and white Ohio Canal Way signs to help you find your way back to the canal, as this road route lies close by. South of Navarre the trail crosses Riverland Road and continues on to the Rt. 212 trailhead just west of Bolivar. This is where contiguous towpath ends, but another segment lies just to the south. Dave Hayslip describes this section, "Currently, the trail can be accessed from the rear of Ft. Laurens by following the Old Zoar Trail to the new bridge built to carry the trail over I-77. From there, it runs about 3 miles south to the Canal Lands trailhead. From there, it goes about another 3 miles to SR 800 but that portion of the trail is unfinished and is better suited as a hiking or bridle trail." Completion of the entire towpath looks to be few years away. Current projections are that much of it will be complete by 2010, with a few small sections yet to finish by 2012. However, the northern most segment through the industrial flats in Cleveland may take until 2016. By then the total length of the trail will be somewhere around 100 miles. However, trail construction is moving right along with new trail sections being finished on an almost annual basis. If you enjoy riding on the towpath, you should have new trail sections to explore every year or so. Several years ago we paid a visit to the Zoar trailhead near the Dover Dam Levee along Dover-Zoar Road. At that time the trailhead parking area revealed a sign that read, Pedestrians Only. Back then the trail consisted of an earthen pathway through the grass along the old towpath route as trail development was scarce at that time. The larger improvement projects such as major bridge restoration, would come later. The trail was open, yes. But bikes were not allowed. That's a real shame considering mountain biking along this track would not only be very interesting, it wouldn't do any harm. Ironically, bike lanes start at Bolivar at I-77 and extend along 212 through Zoar. A great way of connecting towpath cyclists to local points of interest, as well as getting locals to the trail... if/when bikes are allowed at some point, that is. The Zoar Trail and the Elmore portion of the N.C.I.T. are the only two trail sections we know of that are to become parts of major multi-use trails, but do not allow bikes at this time. If you have updated info concerning either of these sections, please let us know. Facilities: There are a number of restrooms, port-a-johns & water stops on the trail, though sometimes they may be several miles apart. Take at least 2 water bottles with you. Food: Eats places just off the trail in Peninsula, a small carryout at Boston Mills (bottled water, ice cream bars, etc.). Fast food within sight of the trail in Independence as well as north Akron. Ice cream shop on the trail in Canal Fulton. Restaurant at the Lake Ave Trailhead in Massillon. Many restaurants within sight of the trail. Parking: Parking lots at most of the cities & villages listed above. A complete list of trailheads can be found on the Inquisitve Visitor's Guide web site. Bike Shops: About .8 mile from the Snyder Road Trailhead in Barberton. Take 2nd Street north. On the trail in Massillon at the Lake Avenue Trailhead is a bike shop that offers rentals, as well as a Running Supply store.